Our market is held at 328 Broad Street in Pioneer Plaza Park, we will open Saturdays June 16, 2018 and run till September 15th! Open 9 am-1 pm except on special event dates-Opening Day, Kid's Day, and Auto Show Day. 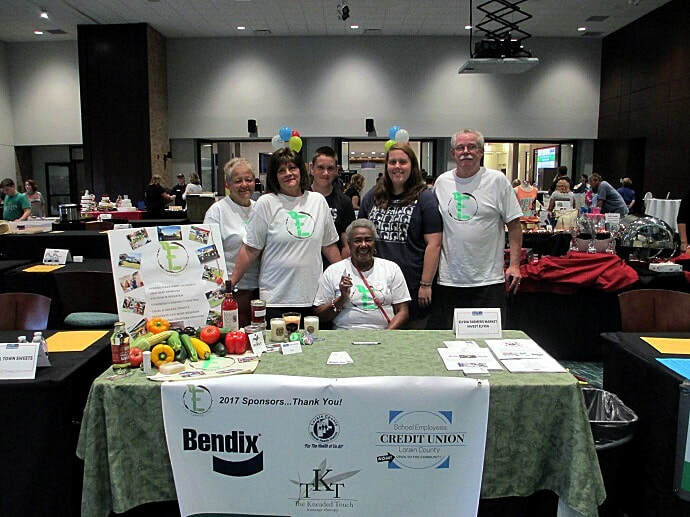 We are currently looking for vendors if interested contact us by email at t.bryan@investelyria.org. or click this link for vendor resources and your vendor's application. 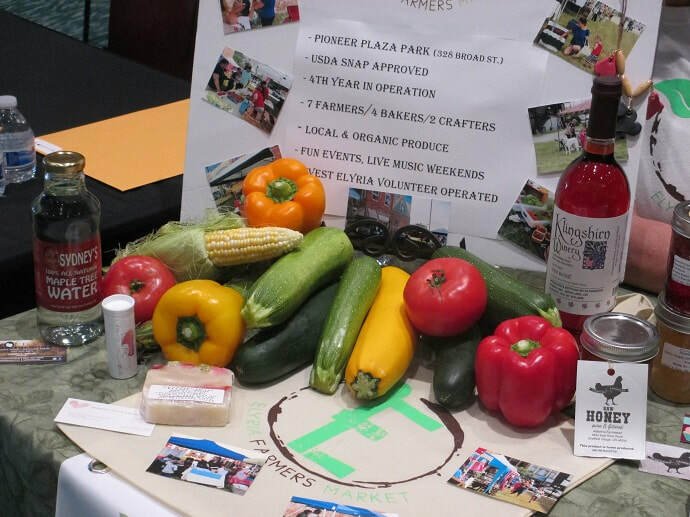 At the market we feature locally grown and prepared foods, homemade goods and a family friendly environment. By Lisa Roberson | The Chronicle-TelegramPublished on July 24, 2018 | Updated 7:04 a. m.
​​Elyria Pride Day: Some photos of Invest Elyria Volunteers sprucing up #1 Fire Station this morning for Elyria Pride Day. Special Thanks to Schuster's Greenhouse for donating the flowers and Harriet James for donating the Day Lillies. 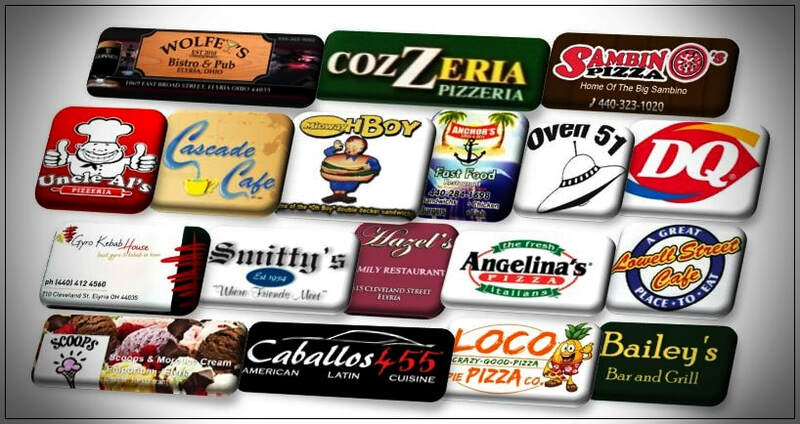 ​"Taste of Elyria": ​Invest Elyria invites you to go out and enjoy the food in our local restaurants this month of May. ​​​Invest Elyria held it's third annual Pancake Breakfast Fundraiser on Saturday March 24, 2018 at St. Andrews Episcopal Church Hall, 300 3rd St. in downtown Elyria from 8 a.m-11 a.m.. This year's theme was "Breakfast with the Easter Bunny". We would like to thank all sponsors, all of you that stopped by for breakfast, and all the IE volunteers for your hard work...Thank You! ​We'd like to thank all the generous folks in Elyria that donated warm items (over 1500 total) for this event. We'd like to especially thank Beth Doyle of the Elyria Hookers for spearheading the Warming Drive. Thank you to the City of Elyria Parks Dept. for allowing use of Ely Square. Thank you to The Salvation Army and Trinity United Methodist of New Springfield Ohio for their generous donations. Elyria DQ on Hilliard Rd. and Roxy's Emporium at 604 Middle Ave. for allowing us to put donation drop-off boxes in their businesses. Thank you to Girls Scout Troops 50323, 50298, and 50933; Bobby Taylor-Lorain County Community Action Agency, Barbie Blackhall -Warm Angel Blankets,and all the Elyria Hookers, IE and friends of IE volunteers for putting out warming items in the square. Giant Eagle/ Oven 51 for donating cookies and donuts, and Cascade Cafe for the hot coffee on a very cold morning. 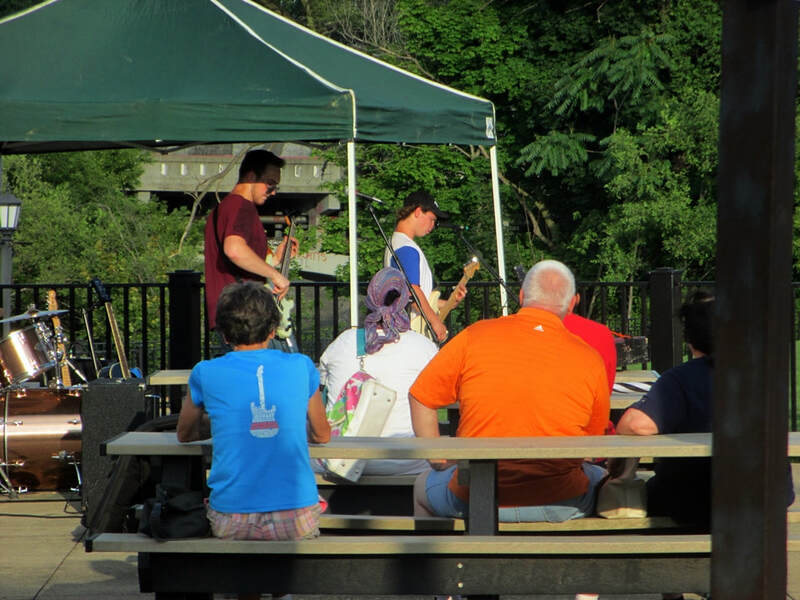 ​The Scenic East Falls Concert, Saturday, July 22nd: ​Our 2nd East Falls Concert -There was Live music featuring the Ridge Rock Band, food vendors and more. Food was provided by Taco Mike's, and Deb's Doggz we also had pre-concert activities for kids before and during he concert. Thanks to all that came out on this beautiful evening! Some great music and the weather last night was beautiful. 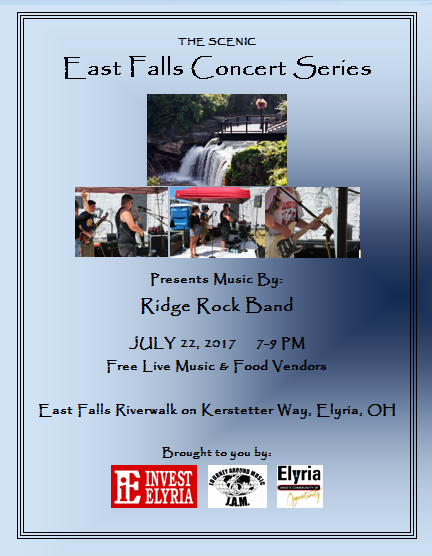 Hope to see more Elyrians come out for our next free concert in July. ​Our market is held at 328 Broad Street in Pioneer Plaza Park, we will open Saturdays June 17, 2016 and run till September 9th! We are currently looking for vendors. Interested vendors should contact us by email at t.bryan@investelyria.org. or click the link below for vendor resources and your vendor's application. Spread the word and shop local! 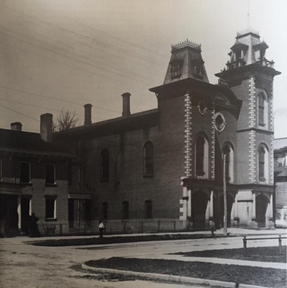 ​Published on July 19, 2017 | Updated 10:27 a. m.
Invest Elyria is gearing up for the Elyria Bicentennial in 2017, We are asking Elyrians to send old photos of Elyria throughout 2016 so we can display them in our Bicentennial window in downtown Elyria and on this website. With the photos you send please give us as much info as you can: The approximate date/yr. of the photos who/what is in the photo, the location etc.. Send your photos to t.bryan@investelyria.org Thank you!!! Contact IE if you need a library near you filled we still have plenty of books left from our Book Drive. 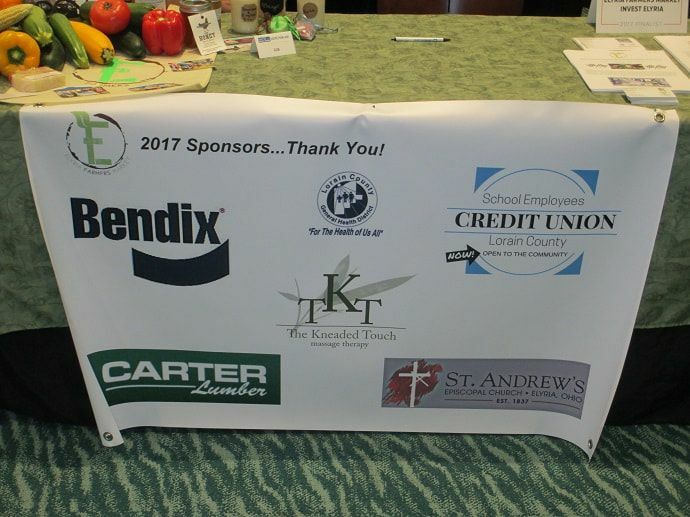 Sponsors for this year's Elyria Farmers Market...Thank You! ​We would like to thank all IE's volunteers(The Beckwith family, Robert Tirado, Bobbie and Taylor Sears and the Boy Scout Troop with their leaders) that helped out for this event. We'd also like to thank the firemen at Fire Station#1 for the fantastic job they did cleaning the beds in preparation for Elyria Pride Day. Thank you April Adamec, Cathy Hutchinson, and Harriet James for donating plants. Thank you to: Gerber's Garden Center, Piazza's Greenhouse, and Schuster's Garden Center for their generous donations of flowers for this event. January 2016- Invest Elyria receives official non-profit status 501c3 from the IRS : We will be seeking tax deductible donations for events and community projects so we can do bigger and better things as an organization. As we work toward this goal, there are a number of other resources that cost money such as: printing, advertising, office supplies, canopies for events, banners, promotional stickers and more. Click on the Donate button below to make your contribution...Thank You! Header Video of the Black River Courtesy of Robert Tirado Jr.